Fwd: Attend Marriage Encounter to Build a Lasting Marriage - Ethics & Religion Col. Editors: This is a particularly important column, suggesting that all married couples attend a Marriage Encounter weekend retreat. I tell our personal story of attending one after ten years of marriage – with rather embarrassing details about my ignorance of major flaws in our marriage. More than 3 million couples have revived their marriage by attending. A colleague, Marco Ciavolino, found the perfect illustration for it, and added an email contact. If you are interested in a one-shot publication of my column, call me at 301-978-7105. Men are generally not as religious as women. But this is a mistake that can be rectified. If he asks her to go to church, she will be impressed. A man open to God is a man who can win over a woman who is more apt to be a believer. Why is this so? A study of the 2006 National Survey of Religion and Family Life, found that church-going was a positive for relationships. Couples who attend church are happier - 11% more apt to report they were "very happy" or "extremely happy," compared with non-attenders. Couples who pray together are 17% more likely to report marital satisfaction. I did not know that in the first decade of our marriage. We went to church weekly from the beginning, and I was very happy in the marriage. But by Year 10 Harriet was not. I did not know this until we went to a Marriage Encounter, an intensive weekend retreat that has been attended by 3 million couples. 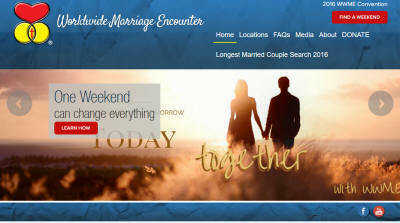 Several couples at church encouraged us to go to Marriage Encounter. I asked, "What is it?" They were rather mysterious about it, only saying that it "will strengthen your marriage." I replied, "I already have a good marriage." "But Marriage Encounter is designed to make a good marriage better. It is not aimed at the troubled marriage," I was told. When I asked for details on what happens, one man replied, "I can't reveal details, but it was the best thing my wife and I ever did together." That sounded good enough to me, though the mystery was annoying. However, when I suggested to Harriet that we go, she was cold and firm: "No." Why? "We can't just leave. We have three small children." When one of the couples encouraging us to go again approached us, I replied, "We have three boys at home." They replied, "That's no problem. Some of us would be glad to take care of them." Harriet countered, "But we can't afford a weekend at a motel." Our friends responded, "You don't understand. You way has already been paid. People here love you enough to make it possible for you to go." Wow! That impressed me. "Come on, Harriet, let's go." She relented. Some background on our situation. We lived in Connecticut so I could produce a series of TV programs on 18 New York TV stations framing choices on how to reduce poverty, for example. We also gave people a way to "ballot" on the choices, and 133,000 ballots were mailed in. One result was passage of the Earned Income Tax Credit subsidizing poor families. I wanted to create American Town Meetings involving network TV, TIME and newspapers. I found federal funding to explore the possibility, but had to work in Washington. For a year I got on a 2 am Monday train and got home at 11 pm Friday. At Marriage Encounter, three couples shared their marriage struggles. Their key message was that "Emotions must be expressed - not repressed. Feelings are neither right nor wrong. They simply are. However, you can't expect your spouse to know them unless you share them." We were then asked to write a "love letter" to each other on assigned topics, and then to speak with each other in private. One topic was to share something that "I have wanted to share with you that I couldn't or didn't share." Harriet wrote, "You left me for over a year. I felt deserted." I was shocked. In our conversation afterward, she added, "This is no marriage! I never saw you during the week, and when you came home, you would fall asleep. You are not a husband and are not a father!" Stunned, I asked, "What do you mean?" "Now you come home every night, but you have no time for me and the kids. You work all weekend. I asked you on Sunday to take the kids for a swim and you said, `I have to write.' You always have to write. You love your career more than me and the children!" I broke down and cried. I was so absorbed by the difficulty of my life I had no idea of its impact on Harriet and the kids. I asked for her forgiveness and resolved to change. We began getting up early to read Scripture daily and pray. We learned to put Christ at the center of our marriage. Today we have an imperfect but healthy marriage that has thrived for over 50 years. Copyright (c) 2016 Michel J. McManus, President of Marriage Savers and a syndicated columnist. For previous columns go towww.ethicsandreligion.org. Hit Search for any topic.